When Sean Stanley is on top of his game, the rest of the team follows. Stanley set two meet records at the Cougar Relays, leading his team to victory with 84 total points. Stanley started off the season with an eight foot PR in the discus when he broke his former teammate's meet record of 152-05 by over five feet. His mark in the discus of 157-08 and mark in the shot put of 54-04.50 were the best outdoor marks from Montgomery County athletes in many years, although he did throw further in the shot put this indoor season. He set the tone for a very successful day for Gaithersburg, especially in the field. Owen Cain was everywhere for the Trojans. He contributed to the winning high jump relay, the winning 110 shuttle hurdle relay, the second place long jump relay and the third place triple jump relay. As they always do, Gaithersburg pulled out some new weapons in the field events including Joey Skidmore who tied for the highest mark in the high jump at 5-10. 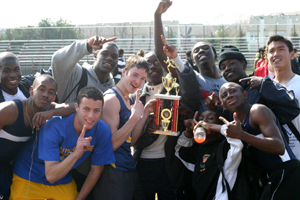 Gaithersburg would have won the meet between their field events and hurdlers, but they also showed great depth in all of the running relays - depth that they did not have indoors. Antonio Palmer helped his team all day, most notably bringing his team from five seconds back to win the sprint medley relay in a meet record time of 3:37. Palmer split 1:55. The one thing that no one had an answer for was the Blair Relays. Montgomery Blair set the meet records in the 4x1, 4x2, and 4x4 with an incredible showing of speed and strength. Blair knows their speed is where it needs to be, so they had been practicing technique all week. Even still, they had a few mishaps and bad handoffs that they can improve upon. 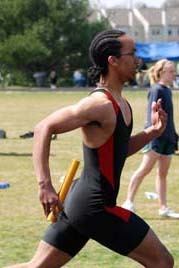 Jonathan Haughton was the rock who participated on all three record-setting Blair relays. He had a great start in the 4x1 which gave them a lead going into the first handoff. That lead, however was almost blown by a bad handoff going into the final leg. Luckily, Mohamad Mansaray had enough speed to pull out the win in a meet record time of 44.0. Haughton's start in the 4x200 was not so smooth. With no one to hold his blocks, they flew out from behind him when the gun went off. After a stumble, he found his stride and quickly regained ground. Chris Grindley kept the race fairly close with Clarksburg before Varella gained a lead in the third leg. It was a much needed lead because Avery Graham was anchoring for Clarksburg. Mansaray took off with his mouth wide open and tongue out. He was able to keep Graham at bay and set the meet record in 1:30.2. Starts and handoffs looked good as Blair dominated the 4x4 from the start. Nilan Schnure and Haughton kept the race close with Bowie High before Grindley opened up a giant gap on the third leg. Despite the large lead that they had, Varella had a tremendous anchor leg, splitting 49 seconds. They finished with their third meet record in a time of 3:23.3. Blair did not have enough athletes in field events or distance events to compete with Gaithersburg or second place Quince Orchard, but they did take third place overall. Highlighting the day for the home team, Quince Orchard, was the winning 4x800-meter relay and the winning distance medley relay. In both events, they were shy of the meet records. Caleb Malone placed second in the 300-meter intermediate hurdles and Artem Panasenkov finished in second place in the devil takes the hindmost. Marcus Brown placed fourth in the shot put with a throw of 49-02.50. Ian Francis of Walter Johnson set the meet record in the triple jump at 44 feet and also won the long jump in 20 feet and 4 inches. Tyler Jackson broke Zach Ray's meet record in the 300-meter hurdles of 40.3 with a run of 40.0. Dylan Straughan made it a three-year sweep by B-CC athletes in the Devil Takes the Hindmost race. He ran a total distance of 8000 meters in 27:09. He won by sticking with the pack the entire race and using his speed in the last half mile to stay in front of the final two opponents.